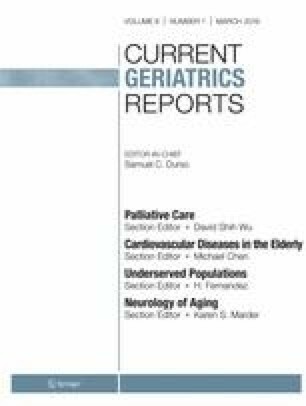 To understand the current scope of training in geriatrics in rural areas for rural providers and teams, we reviewed current literature to identify training programs which pertain to geriatric education and training of the rural workforce. Older adults are one of the fastest growing demographics in the USA and represent a higher share of the population in rural areas than in other counties. Older adults in rural areas often have complex health challenges and may benefit from care from healthcare teams with geriatrics training. However, there is a paucity of geriatrics workforce in the country and particularly in rural areas. Geriatric training programs targeting rural practitioners may serve to bridge this gap through providing training and support to rural teams taking care of older adults in rural areas. Ten unique programs were identified which described efforts to introduce geriatrics to rural practitioners. Each used different methods of training at a distance, leveraging the use of telecommunications and the internet, or face-to-face training methods alone or in combination with distance training. Improvements in clinician knowledge, skills, and other impacts were described. Current evidence demonstrates that providing training in geriatrics is feasible and may yield positive impacts on rural clinical teams and potential downstream effects on patient care. Annette Hintenach and Oren Raphael are co-first authors. Annette Hintenach, Oren Raphael, and William W. Hung declare no conflict of interest. Eldercare Workforce Alliance. Caring for an aging America: meeting the health care needs of older adults. 2013. http://eldercareworkforce.org/caring-for-an-aging-america-meeting-the-health-care-needs-of-older-adults/. Accessed Dec 2018. Institute of Medicine [IOM]. Retooling for an aging America: building the health care workforce. Washington, D.C: The National Academies Press; 2008. https://www.nap.edu/read/12089/chapter/1#xi. Accessed 26 March 2019. National Rural Health Association [NRHA]. Elder health in rural America. 2013. https://www.ruralhealthweb.org/getattachment/Advocate/Policy-Documents/ElderHealthinRuralAmericaFeb2013.pdf.aspx. Accessed Dec 2018. Office of Rural Health (ORH). Rural veteran health care challenges. U.S. Department of Veteran Affairs. 2018. https://www.ruralhealth.va.gov/aboutus/ruralvets.asp. Accessed Dec 2018. Bolin JN, Bellamy GR, Ferdinand AO, Vuong AM, Kash BA, Schulze A, et al. Rural healthy people 2020: new decade, same challenges. J Rural Health. 2015;31(3):326–33. https://doi.org/10.1111/jrh.12116. American Board of Medical Specialties. ABMS Board Certification Report 2017-2018. 2018. https://www.abms.org/media/194885/abms-board-certification-report-2017-2018.pdf. Accessed Dec 2018. Office of Rural Health. U.S. Department of Veteran Affairs. Rural Promising Practices. 2017. https://www.ruralhealth.va.gov/providers/promising_practices.asp. Accessed 4 April 2019. Hung WW, Rossi M, Thielke S, Caprio T, Barczi S, Kramer BJ, et al. A multisite geriatric education program for rural providers in the veteran health care system (GRECC-Connect). Gerontol Geriatr Educ. 2014;35(1):23–40. https://doi.org/10.1080/02701960.2013.870902. Truong HA, Gorman MJ, East M, Klima DW, Hinderer KA, Hogue GL, et al. The eastern shore collaborative for interprofessional education’s implementation and impact over five years. Am J Pharm Educ. 2018;82(4):6522. https://doi.org/10.5688/ajpe6522.